Our PDQ Wake Forest, PDQ Raleigh, and PDQ Durham Teams are helping to bring smiles to children in need this holiday season with the help of Archangel Alliance, a nonprofit organization serving families in need throughout North Carolina. Starting November 1st, the PDQ locations listed above will host its third annual Holiday Angel Tree. Guests are encouraged to select an angel from the tree on their next PDQ visit and shop for a gift. Guests can return all unwrapped gifts back to PDQ with the Angel Tree tag and place them under the tree by December 8th. 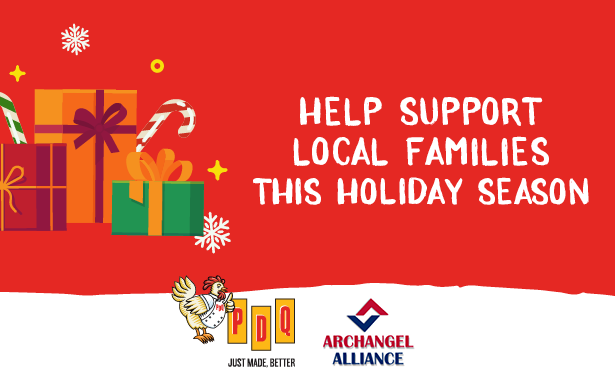 "Archangel Alliance looks forward to partnering with PDQ each year for this event, in hopes of making a difference in the lives of children during the holidays," said Joann Snyder from Archangel Alliance. "Our PDQ team is proud to partner with Archangel Alliance to make a difference in our community,” said Amy Foley, Carolinas Market Director. “This initiative will impact many people and we are excited to work with others who are also People Dedicated to Quality." In previous years, PDQ and Archangel Alliance have helped around 175 children combined, and are set to have 250 angels this year! All gifts collected will be donated to children in the Wake Forest, Durham, and Raleigh community this holiday season.